MISAWA AIR BASE, Japan (Oct. 06, 2000) -- Those wishing to satisfy a late night craving for chicken wings, or those just looking for polite conversation with a friendly face in the middle of the night, needn't look further than the recently reopened Café Mokuteki located near the base bowling alley. Café Mokuteki recently held a grand reopening party to celebrate its new 24-hour schedule, its new menu and its new delivery service. Jen Collins, Café Mokuteki employee, steams milk for a latte' at the Mokuteki coffee bar. "I think being open 24-hours will provide a service that this base has needed for a long time," said David Huston, Café Mokuteki manager. "Service members can come in at any time and get anything they want off the menu. If you're a third-shift worker and get off of work at nine o'clock at night you can come in and get a nice hot breakfast, 24-hours a day." Café Mokuteki made the transition to a 24-hour eatery in response to requests from many base members who have found themselves hankering for a snack in the middle of the night. "The 35th Services Squadron requires one facility to stay open 24-hours for shift workers," said Huston. "We are directly involved with the services and we felt we could do this with the lowest cost factor, we also thought 'we can do this right.'" Both a radio and an espresso machine decorate the Café Mokuteki as part of its 50's motiff. Café Mokuteki serves up everything from steaming hot espresso and sizzling hot burgers, to crisp salads and ice-cold smoothie drinks, all to support the diverse tastes of Misawa Air Base. In that tradition, Café Mokuteki has added even more items to its eclectic menu. "We've completely redone the menu," said Huston. "We've added cheese steak sandwiches, chicken cheese steak sandwiches, taco pizza, and a variety of desert pizzas. For breakfast we've added fruitcakes, which is basically a pancake rolled up with fruit filling and whipped cream, we've added the breakfast burrito and hard-boiled eggs for the healthy menu. We also have a soup-of-the-day now and chili. We have something for everybody." In addition to the late hours and the expanded menu, Café Mokuteki offers another option to base residents that makes enjoying Café Mokuteki fare even easier. The diner now offers deliver service. 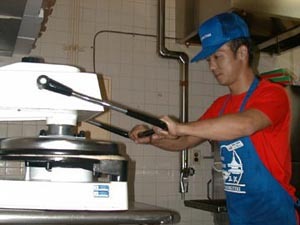 Shigeto Yamuchi, a Café Mokuteki employee, presses dough for a pizza crust in the Mokuteki kitchen. "As of Sunday we started delivery service," said Huston. " We deliver from 5 p.m. to midnight, seven days a week, on the main base. When this gets out of the experimental stage, we will expand to the entire base." The new delivery service may eventually prove to be a real service to many service members who may not be able to get away from their work centers to grab a bite to eat. "I know a big supporter of our delivery service is the hospital," said Huston. "Some of them don't get their lunch until 11:30 p.m. at night, and they cannot leave. If they order a pizza early, it will be cold when they eat. We can deliver hot and fresh when they have their lunch." Café Mokuteki delivers virtually the entire menu between 5 p.m. and midnight. Huston added there is an eight-dollar minimum on delivery orders. For delivery service on the main base, call 222-6392. One patron, Senior Airman John H. Collins a shift worker with Detachment 3, 18th Intelligence Squadron, is sure to benefit from the new hours at Café Mokuteki. "I work late, when I'm sitting at my [work station] and I get a craving for something to eat, there isn't anywhere to go. Everything is closed," said Collins. "I would have to go off base late at night and find someplace open...and if you don't have yen, you don't eat." With the new 24-hour schedule at Café Mokuteki, Collins now has an option that is just a little closer to home and work. For those worried about not having the right currency to pay for their dinner, the Café Mokuteki takes yen, dollars and even the club card. The new hours, the extended menu and the delivery service at Café Mokuteki are just one of the many ways Misawa Air Base leaders are working to respond to the needs of base residents, and to improve the quality of life here.